*Almost 918,000 killed, wounded and missing. *700,000 killed, 604,000 wounded, 36,000 missing. 2,093 aircraft. At least 802,191 killed, unknown wounded, and some 3,300,000 captured. Operation Barbarossa (German: Unternehmen Barbarossa) was the codename for Nazi Germany's invasion of the Soviet Union during World War II that commenced on June 22, 1941. Over 4.5 million troops of the Axis powers invaded the USSR along an 1,800 mile front. The operation was named after the Emperor Frederick Barbarossa of the Holy Roman Empire, a leader of the Third Crusade in the 12th century. Barbarossa was the major part of the war on the Eastern Front. The planning for Operation Barbarossa started on December 18, 1940; the clandestine preparations and the military operation itself lasted almost a year, from the spring of 1941, through the winter of 1941. 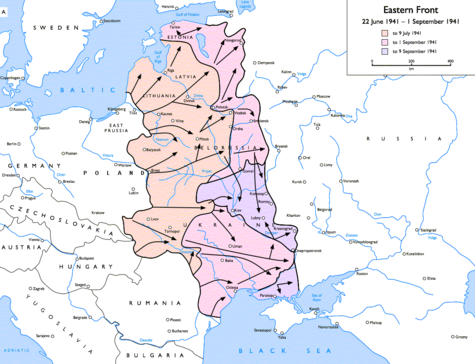 The operational goal of Barbarossa was the rapid conquest of the European part of the Soviet Union west of a line connecting the cities of Arkhangelsk and Astrakhan, often referred to as the A-A line (see the translation of Hitler's directive for details). At its conclusion in December 1941, the Red Army had repelled the strongest blow of the Wehrmacht. Hitler had not achieved the victory he had expected, but the situation of the Soviet Union remained critical. Tactically, the Germans had won some resounding victories and occupied some of the most important economic areas of the country, most notably in Ukraine. Despite these successes, the Germans were pushed back from Moscow and were never able to mount an offensive simultaneously along the entire strategic Soviet-German front again. The ultimate failure of Operation Barbarossa would prove a death knell to the Nazi ambition to dominate Europe and the world and lead to the defeat of the Axis powers during World War II, resulting in the triumph of the democratic forces. Nazi policy aimed to destroy the Soviet Union as a political entity in accordance with the geopolitical Lebensraum idea ("Drang nach Osten") for the benefit of future "Aryan" generations in the centuries to come. The Führer anticipated additional benefits, including cheap labor, the agricultural bounty of Ukraine and access to the oil of the Baku Oilfields. Operation Barbarossa represented a northern assault towards Leningrad, a symbolic capturing of Moscow, and an economic strategy of seizing oil fields in the south, towards Ukraine. Hitler and his generals disagreed on where Germany should focus its energies, and so Barbarossa was largely a compromise of these views. Hitler considered himself a political and military genius. In the course of planning Barbarossa during 1940 and 1941, in many discussions with his generals, Hitler repeated his order: "Leningrad first, the Donetsk Basin second, Moscow third." Hitler was impatient to get on with his long-desired invasion of the east. He was convinced that Great Britain would sue for peace, once the Germans triumphed in the Soviet Union, the real area of Germany's interests. General Franz Halder noted in his diaries that, by destroying the Soviet Union, Germany would destroy Britain's hope of defeating Germany. Hitler was also over-confident, due to his rapid success in Western Europe, as well as the Red Army's ineptitude in the Winter War against Finland in 1939–1940. He expected victory within a few months and therefore did not prepare for a war lasting into the winter; his troops therefore lacked adequate warm clothing and preparations for a longer campaign when they began their attack. The assumption that the Soviet Union would quickly capitulate would prove to be his undoing. In preparation for the attack, Hitler moved 3.5 million German soldiers and about one million Axis soldiers to the Soviet border, launched many aerial surveillance missions over Soviet territory, and stockpiled materiel in the East. The Soviets were still taken by surprise, mostly due to Stalin's belief that the Third Reich was unlikely to attack only two years after signing the Molotov-Ribbentrop Pact. The Soviet leader also believed that the Nazis would likely finish their war with Britain before opening a new front. He refused to believe repeated warnings from his intelligence services on the Nazi buildup, fearing the reports to be British misinformation designed to spark a war between the Nazis and the Communists. The spy Dr. Richard Sorge gave Stalin the exact German launch date; Swedish cryptanalysts led by Arne Beurling also knew the date beforehand. The Germans set up deception operations, from April 1941, to add substance to their claims that Britain was the real target: Operations Haifisch and Harpune. These simulated preparations in Norway, the Channel coast and Britain. There were supporting activities such as ship concentrations, reconnaissance flights and training exercises. Invasion plans were developed and some details were allowed to leak. Hitler and his generals also researched Napoleon's failed invasion of Russia. At Hitler's insistence, the German High Command (OKW) began to develop a strategy to avoid repeating these mistakes. The strategy Hitler and his generals agreed upon involved three separate army groups assigned to capture specific regions and cities of the Soviet Union. The main German thrusts were conducted along historical invasion routes. Army Group North was assigned to march through the Baltics, into northern Russia, and either take or destroy the city of Leningrad (now Saint Petersburg). Army Group Center would advance to Smolensk and then Moscow, marching through what is now Belarus and the west-central regions of Russia proper. Army Group South was to strike the heavily populated and agricultural heartland of Ukraine, taking Kiev before continuing eastward over the steppes of southern Russia all the way to the Volga and the oil-rich Caucasus. Hitler, the OKW and the various high commands disagreed about what the main objectives should be. In the preparation for Barbarossa, most of the OKW argued for a straight thrust to Moscow, whereas Hitler kept asserting his intention to seize the resource-rich Ukraine and Baltics before concentrating on Moscow. An initial delay, which postponed the start of Barbarossa from mid-May to the end of June 1941, may have been insignificant, especially since the Russian muddy season came late that year. However, more time was lost at various critical moments as Hitler and the OKW suspended operations in order to argue about strategic objectives. Along with the strategic objectives, the Germans also decided to bring rear forces into the conquered territories to counter any partisan activity which they knew would erupt in the areas they controlled. This included units of the Waffen-SS and the Gestapo who specialized in crushing dissent and capturing and killing opponents. Despite the estimation by Hitler and others in the German high command, the Soviet Union was by no means a weak country. Rapid industrialization in the 1930s had resulted in industrial output second only to that of the United States, and equal to that of Germany. Production of military equipment grew steadily, and in the pre-war years the economy became progressively more oriented toward military production. In the early 1930s, a very modern operational doctrine for the Red Army was developed and promulgated in the 1936 field regulations. In 1941, the Soviet armed forces in the western districts were outnumbered by their German counterparts, 2.6 million Soviet soldiers vs. 4.5 million for the Axis. The overall size of the Soviet armed forces in early July 1941, though, amounted to a little more than 5 million men, 2.6 million in the west, 1.8 million in the far east, with the rest deployed or training elsewhere. Moreover, on mobilization, as the war went on, the Red Army gained steadily in strength. While the strength of both sides varied, in general it is accurate to say that the 1941 campaign was fought with the Axis having slight numerical superiority in manpower at the front. The Russian war effort in the first phase of the Eastern front war was severely hampered by a shortage of modern aircraft. The Soviet fighter force was equipped with large numbers of obsolete aircraft, such as the I-15 biplane and the I-16. In 1941, the MiG-3, LaGG-3 and Yak-1 were just starting to roll off the production lines, but were far inferior in all-round performance to the Messerschmitt Bf 109 or later, the Fw 190, when it entered operations in September 1941. Few aircraft had radios and those that were available were unencrypted and did not work reliably. The poor performance of VVS (Voenno-Vozdushnye Sily, Soviet Air Force) during the Winter War with Finland had increased the Luftwaffe's confidence that the Soviets could be mastered. The standard of flight training had been accelerated in preparation for a German attack that was expected to come in 1942 or later. But Russian pilot training was extremely poor. Order No 0362 of the People's Commissar of Defense, dated December 22, 1940, ordered flight training to be accelerated and shortened. Incredibly, while the Soviets had 201 MiG-3s and 37 MiG-1s combat ready on June 22, 1941, only four pilots had been trained to handle these machines. The Red Army was dispersed and unprepared, and units were often separated and without transportation to concentrate prior to combat. Although the Red Army had numerous, well-designed artillery pieces, some of the guns had no ammunition. Artillery units often lacked transportation to move their guns. Tank units were rarely well-equipped, and also lacked training and logistical support. Maintenance standards were very poor. Units were sent into combat with no arrangements for refueling, ammunition resupply, or personnel replacement. Often, after a single engagement, units were destroyed or rendered ineffective. The army was in the midst of reorganizing the armor units into large tank corps, adding to the disorganization. As a result, although on paper, the Red Army in 1941 seemed at least the equal of the German army, the reality in the field was far different; incompetent officers, as well as partial lack of equipment, insufficient motorized logistical support, and poor training placed the Red Army at a severe disadvantage. For example, throughout the early part of the campaign, the Red Army lost about six tanks for every German tank lost. In the spring of 1941, Stalin's own intelligence services made regular and repeated warnings of an impending German attack. However, Stalin chose to ignore these warnings. Enormous Soviet forces were massed behind the western border in case the Germans did attack. However, these forces were very vulnerable due to changes in the tactical doctrine of the Red Army. In 1938 it had adopted, on the instigation of General Pavlov, a standard linear defense tactic on a line with other nations. Infantry divisions, reinforced by an organic tank component, would be dug in to form heavily fortified zones. Then came the shock of the Fall of France. The French Army was defeated in a mere six weeks. Soviet analysis of events, based on incomplete information, concluded that the collapse of the French was caused by a reliance on linear defense and a lack of armored reserves. The Soviets decided not to repeat these mistakes. Instead of digging in for linear defense, the infantry divisions would henceforth be concentrated in large formations. At 3:15 A.M. on Sunday, June 22, 1941, the Axis attacked. It is difficult to precisely pinpoint the strength of the opposing sides in this initial phase, as most German figures include reserves slated for the East but not yet committed, as well as several other issues of comparability between the German and USSR's figures. A reasonable estimate is that roughly three million Wehrmacht troops went into action on June 22, and that they were facing slightly fewer Soviet troops in the border Military Districts. The contribution of the German allies would generally only begin to make itself felt later in the campaign. The surprise was complete: though the Stavka, alarmed by reports that Wehrmacht units approached the border in battle deployment, had at 00:30 A.M. ordered that the border troops be warned that war was imminent, only a small number of units were alerted in time. The shock stemmed less from the timing of the attack than from the sheer number of Axis troops who struck into Soviet territory simultaneously. Aside from the roughly 3.2 million German land forces engaged in, or earmarked for the Eastern Campaign, about 500,000 Romanian, Hungarian, Slovakian, Croatian, and Italian troops eventually accompanied the German forces, while the Army of Finland made a major contribution in the north. The 250th Spanish "Blue" Infantry Division was an odd unit, representing neither an Axis nor a Waffen-SS volunteer formation, but that of Spanish Falangists and Nazi sympathizers. Reconnaissance units of the Luftwaffe worked at a frantic pace to plot troop concentration, supply dumps, and airfields, and mark them for destruction. The task of the Luftwaffe was to neutralize the Soviet Air Force. This was not achieved in the first days of operations, despite the Soviets having concentrated aircraft in huge groups on the permanent airfields rather than dispersing them on field landing strips, making them ideal targets. The Luftwaffe claimed to have destroyed 1,489 aircraft on the first day of operations. Hermann Göring, Chief of the Luftwaffe distrusted the reports and ordered the figure checked. Picking through the wreckages of Soviet airfields, the Luftwaffe's figures proved conservative, as over 2000 destroyed Soviet aircraft were found. The Germans claimed to have destroyed only 3,100 Soviet aircraft in the first three days. In fact the Soviet losses were far higher, some 3,922 Soviet machines had been lost (according to Russian historian Viktor Kulikov). The Luftwaffe had achieved air superiority over all three sectors of the front, and would maintain it until the close of the year, largely due to the need by the Red Army Air Forces to maneuver in support of retreating ground troops. The Luftwaffe would now be able to devote large numbers of its Geschwader (See Luftwaffe Organization) to support the ground forces. Opposite Heersgruppe Nord were two Soviet armies. The Wehrmacht OKH thrust the 4th Panzer Group, with a strength of 600 tanks, at the junction of the two Soviet armies in that sector. The 4th Panzer Group's objective was to cross the rivers Neman and Daugava (Dvina) which were the two largest obstacles in the direction of advance towards Leningrad. On the first day, the tanks crossed the River Neman and penetrated 50 miles (80 km). Near Raseiniai, the tanks were counterattacked by 300 Soviet tanks. It took four days for the Germans to encircle and destroy the Soviet armor. The Panzer Groups then crossed the Daugava near Daugavpils. The Germans were now within striking distance of Leningrad. However, due to their deteriorated supply situation, Hitler ordered the Panzer Groups to hold their position while the infantry formations caught up. The orders to hold would last over a week, giving time for the Soviets to build up a defense around Leningrad and along the bank of River Luga. Further complicating the Soviet position, on June 22 the anti-Soviet June Uprising in Lithuania began, and on the next day an independent Lithuania was proclaimed. An estimated 30,000 Lithuanian rebels engaged Soviet forces, joined by ethnic Lithuanians from the Red Army. As the Germans reached further north, armed resistance against the Soviets broke out in Estonia as well. The "Battle of Estonia" ended on 7 August, when the 18.Armee reached the coast at Kunda. Opposite Heersgruppe Mitte were four Soviet armies: the 3rd, 4th, 10th and 11th Armies. The Soviet Armies occupied a salient which jutted into German occupied Polish territory with the Soviet salient's center at Bialystok. Beyond Bialystok was Minsk, both the capital of Belorussia and a key railway junction. The goals of the AG Center's two Panzer Groups was to meet at Minsk, denying an escape route to the Red Army from the salient. The 3rd Panzer Group broke through the junction of two Soviet Fronts in the North of the salient, and crossed the River Neman while the 2nd Panzer Group crossed the Western Bug river in the South. While the Panzer Groups attacked, the Wehrmacht Army Group Center infantry Armies struck at the salient, eventually encircling Soviet troops at Bialystok. Moscow at first failed to grasp the dimensions of the catastrophe that had befallen the USSR. Marshall Timoshenko ordered all Soviet forces to launch a general counter-offensive, but with supply and ammunition dumps destroyed, and a complete collapse of communication, the uncoordinated attacks failed. Zhukov signed the infamous Directive of People's Commissariat of Defense No. 3 (he later claimed under pressure from Stalin), which demanded that the Red Army start an offensive: he commanded the troops “to encircle and destroy the enemy grouping near Suwałki and to seize the Suwałki region by the evening of June 26" and “to encircle and destroy the enemy grouping invading in Vladimir-Volynia and Brody direction” and even “to seize the Lublin region by the evening of 24.6” This maneuver failed and disorganized Red Army units, which were soon destroyed by the Wehrmacht forces. On June 27, 2nd and 3rd Panzer Groups met up at Minsk advancing 200 miles (300 km) into Soviet territory and a third of the way to Moscow. In the vast pocket between Minsk and the Polish border, the remnants of 32 Soviet Rifle, eight tank, and motorized, cavalry and artillery divisions were encircled. Opposite Heersgruppe Süd in Ukraine Soviet commanders had reacted quickly to the German attack. From the start, the invaders faced a determined resistance. Opposite the Germans in Ukraine were three Soviet armies, the 5th, 6th and 26th. The German infantry Armies struck at the junctions of these armies while the 1st Panzer Group drove its armored spearhead of 600 tanks right through the Soviet 6th Army with the objective of capturing Brody. On June 26 five Soviet mechanized corps with over 1000 tanks mounted a massive counter-attack on the 1st Panzer Group. The battle was among the fiercest of the invasion, lasting over four days; in the end the Germans prevailed, though the Soviets inflicted heavy losses on the 1st Panzer Group. With the failure of the Soviet counter-offensives, the last substantial Soviet tank forces in Western Ukraine had been committed, and the Red Army assumed a defensive posture, focusing on conducting a strategic withdrawal under severe pressure. By the end of the first week, all three German Army Groups had achieved major campaign objectives. However, in the vast pocket around Minsk and Bialystok, the Soviets were still fighting; reducing the pocket was causing high German casualties and many Red Army troops were also managing to escape. The usual estimated casualties of the Red Army amount to 600,000 killed, missing, captured or wounded. The Soviet air arm, the VVS, lost 1,561 aircraft over Kiev. The battle was a huge tactical (Hitler thought strategic) victory, but it had succeeded in drawing German forces, away from an early offensive against Moscow, and had delayed further German progress by 11 weeks. General Kurt Von Tippleskirch noted, "The Russians had indeed lost a battle, but they won the campaign". On July 3, Hitler finally gave the go-ahead for the Panzers to resume their drive east after the infantry divisions had caught up. However, a rainstorm typical of Russian summers slowed their progress and Russian defenses also stiffened. The delays gave the Soviets time to organize for a massive counterattack against Army Group Center. The ultimate objective of Army Group Center was the city of Smolensk, which commanded the road to Moscow. Facing the Germans was an old Soviet defensive line held by six armies. On July 6, the Soviets launched an attack with 700 tanks against the 3rd Panzer Army. The Germans defeated this counterattack using their overwhelming air superiority. The 2nd Panzer Army crossed the River Dnieper and closed on Smolensk from the south while the 3rd Panzer Army, after defeating the Soviet counter attack, closed in Smolensk from the north. Trapped between their pincers were three Soviet armies. On July 26, the Panzer Groups closed the gap and 180,000 Red Army troops were captured. Four weeks into the campaign, the Germans realized they had grossly underestimated the strength of the Soviets. The German troops had run out of their initial supplies but still not attained the expected strategic freedom of movement. Operations were now slowed down to allow for a resupply; the delay was to be used to adapt the strategy to the new situation. Hitler had lost faith in battles of encirclement as large numbers of Soviet soldiers had continued to escape them and now believed he could defeat the Soviets by inflicting severe economic damage, depriving them from the industrial capacity to continue the war. That meant the seizure of the industrial center of Kharkov, the Donets Basin and the oil fields of the Caucasus in the south and a speedy capture of Leningrad, a major center of military production, in the north. He also wanted to link up with the Finns to the north. The German generals vehemently argued instead for continuing the all-out drive toward Moscow. Besides the psychological importance of capturing the enemy's capital, the generals pointed out that Moscow was a major center of arms production and the center of the Soviet communications and transportation system. More importantly, intelligence reports indicated that the bulk of the Red Army was deployed near Moscow under Semyon Timoshenko for an all-out defense of the capital. However, Hitler was adamant, and issued an order to send Army Group Center's tanks to the north and south, temporarily halting the drive to Moscow. By mid-July below the Pinsk Marshes, the Germans had come within a few miles of Kiev. The 1st Panzer Army then went south while the German 17th Army struck east and in between the Germans trapped three Soviet armies near Uman. As the Germans eliminated the pocket, the tanks turned north and crossed the Dnieper. Meanwhile, the 2nd Panzer Army, diverted from Army Group Center, had crossed the River Desna with 2nd Army on its right flank. The two Panzer armies now trapped four Soviet armies and parts of two others. For its final attack on Leningrad, the 4th Panzer Army was reinforced by tanks from Army Group Center. On August 8 the Panzers broke through the Soviet defenses; the German 16th Army attacked to the northeast, the 18th Army cleared Estonia and advanced to Lake Peipus. By the end of August, 4th Panzer Army had penetrated to within 30 miles (50 km) of Leningrad. The Finns had pushed southeast on both sides of Lake Ladoga reaching the old Finnish-Soviet frontier. At this stage Hitler ordered the final destruction of Leningrad with no prisoners taken, and on September 9 Army Group North began the final push which within ten days brought it within 7 miles (10 km) of the city. However, the pace of advance over the last ten kilometers proved very slow and the casualties mounted. At this stage Hitler lost patience and ordered that Leningrad should not be stormed but starved into submission. He needed the tanks of Army Group North transferred to Army Group Center for an all-out drive to Moscow. Before the attack on Moscow could begin, operations in Kiev needed to be finished. Half of Army Group Centre had swung to the south in the back of the Kiev position, while Army Group South moved to the north from its Dniepr bridgehead. The encirclement of Soviet Forces in Kiev was achieved on September 16th. The encircled Soviets did not give up easily, and a savage battle ensued in which the Soviets were hammered with tanks, artillery, and aerial bombardment. In the end, after ten days of vicious fighting, the Germans claimed over 600,000 Soviet soldiers captured (but that was false, the German did capture 600,000 males between the ages of 15-70 but only 480,000 were soldiers, out of which 180,000 broke out, netting the Axis 300,000 Prisoners of war). After Kiev, the Red Army no longer outnumbered the Germans and there were no more directly available trained reserves. To defend Moscow, Stalin could field 800,000 men in 83 divisions, but no more than 25 divisions were fully effective. Operation Typhoon, the drive to Moscow, began on October 2nd. In front of Army Group Center was a series of elaborate defense lines, the first centered on Vyazma and the second on Mozhaisk. The first blow took the Soviets completely by surprise as 2nd Panzer Army returning from the south took Orel which was 75 miles (121 km) south of the Soviet first main defense line. Three days later the Panzers pushed on Bryansk while 2nd Army attacked from the west. Three Soviet armies were now encircled. To the north, the 3rd and 4th Panzer Armies attacked Vyazma, trapping another five Soviet armies. Moscow's first line of defense had been shattered. The pocket yielded 663,000 Soviet prisoners, bringing the tally since the start of the invasion to three million Soviet soldiers captured. The Soviets had only 90,000 men and 150 tanks left for the defense of Moscow. On October 13 3rd Panzer Army penetrated to within 90 miles (140 km) of the capital. Martial law was declared in Moscow. Almost from the beginning of Operation Typhoon the weather had deteriorated. Temperatures fell while there was a continued rainfall, turning the unmetalled road network into mud and steadily slowing the German advance on Moscow to as little as 2 miles (3 km) a day. The supply situation rapidly deteriorated. On October 31 the Germany Army High Command ordered a halt to Operation Typhoon while the armies were re-organized. The pause gave the Soviets (who were in a far better supply situation due to the use of their rail network) time to reinforce, and in little over a month the Soviets organized eleven new armies which included 30 divisions of Siberian troops. These had been freed from the Soviet far east as Soviet intelligence had assured Stalin there was no longer a threat from the Japanese. With the Siberian forces would come over 1000 tanks and 1000 aircraft. They remembered what happened to Napoleon's Army. Most of them began to re-read Caulaincourt's grim account of 1812. That had a weighty influence at this critical time in 1941. I can still see Von Kluge trudging through the mud from his sleeping quarters to his office and standing before the map with Caulaincourt's book in his hand. On November 15 with the ground hardening due to the cold weather, the Germans once again began the attack on Moscow. Although the troops themselves were now able to advance again, there had been no delay allowed to improve the supply situation. Facing the Germans were six Soviet armies. The Germans intended to let 3rd and 4th Panzer Armies cross the Moscow Canal and envelop Moscow from the northeast. 2nd Panzer Army would attack Tula and then close in on Moscow from the south. As the Soviets reacted to the flanks, 4th Army would attack the center. In two weeks of desperate fighting, lacking sufficient fuel and ammunition, the Germans slowly crept towards Moscow. However, in the south, 2nd Panzer Army was being blocked. On November 22 Soviet Siberian units attacked the 2nd Panzer Army and inflicted a defeat on the Germans. However, 4th Panzer Army succeeded in crossing the Moscow canal and began the encirclement. On December 2 the 4th Panzer Army had penetrated to within 15 miles (24 km) of Moscow, but by then the first blizzards of the winter began. The Wehrmacht was not equipped for winter warfare. Frostbite and disease caused more casualties than combat, and dead and wounded had already reached 155,000 in three weeks. Some divisions were now at 50 percent strength. The bitter cold also caused severe problems for their guns and equipment, and weather conditions grounded the Luftwaffe. Newly built up Soviet units near Moscow now numbered over 500,000 men and on December 5 they launched a massive counterattack which pushed the Germans back over 200 miles. The invasion of the USSR would cost the German Army over 250,000 dead and 500,000 wounded, the majority of whom became casualties after October 1 and an unknown number of Axis casualties such as Hungarians, Romanians and Waffen SS troops as well as co-belligerent Finns. The Red army and air force were so badly defeated in 1941 chiefly because they were ill-prepared for the surprise attack by the armed forces of the Axis, which by 1941 were the most experienced and best-trained in the world. The Axis had a doctrine of mobility and annihilation, excellent communications, and the confidence that comes from repeated low-cost victories. The Soviet armed forces, by contrast, lacked leadership, training, and readiness. Much of Soviet planning assumed that no war would take place before 1942: thus the Axis attack came at a time when new organizations and promising, but untested, weapons were just beginning to trickle into operational units. And much of the Soviet Army in Europe was concentrated along the new western border of the Soviet Union, in former Polish territory which lacked significant defenses, allowing many Soviet military units to be overrun and destroyed in the first weeks of war. Initially, many Soviet units were also hampered by Semyon Timoshenko's and Georgy Zhukov's prewar orders (demanded by Stalin) not to engage or to respond to provocations (followed by a similarly damaging first reaction from Moscow, an order to stand and fight, then counterattack; this left those military units vulnerable to German encirclements), by a lack of experienced officers, and by bureaucratic inertia. The initial tactical errors of the Soviets in the first few weeks of the Axis offensive proved catastrophic. Initially, the Red Army was fooled by a complete overestimation of its own capabilities. Instead of intercepting German armor, Soviet mechanized corps were ambushed and destroyed after Luftwaffe dive bombers inflicted heavy losses. Soviet tanks, poorly maintained and manned by inexperienced crews, suffered from an appalling rate of breakdowns. Lacks of spare parts and of trucks ensured a logistical collapse. The decision not to dig in the infantry divisions proved disastrous. Without tanks or sufficient motorization, Soviet troops were incapable of waging mobile warfare against the Germans and their allies. Stalin's orders to his troops not to retreat or surrender resulted in a return to static linear positions which German tanks easily breached, again quickly cutting supply lines and surrounding whole Soviet armies. Only later did Stalin allow his troops to retreat to the rear wherever possible and regroup, to mount a defense in depth or to counterattack. More than 2.4 million Soviet troops had been taken prisoner by December, 1941, by which time German and Soviet forces were fighting almost in the suburbs of Moscow. Most of these captured Soviet troops were to die from exposure, starvation, disease, or willful mistreatment by the German regime. Despite the failure of the Axis to achieve Barbarossa's initial goals, the huge Soviet losses caused a shift in Soviet propaganda. Before the onset of hostilities against Germany, the Soviet government had stated that its army was very strong. But, by the autumn of 1941, the Soviet line was that the Red Army had been weak, that there had not been enough time to prepare for war, and that the German attack had come as a surprise. The climax of Operation Barbarossa came when Army Group Center, already short on supplies because of the October mud, was ordered to advance on Moscow; forward units came within sight of the spires of the Kremlin in early December 1941. Soviet troops, well supplied and reinforced by fresh divisions from Siberia, defended Moscow in the Battle of Moscow, and drove the Germans back as the winter advanced. The bulk of the counter-offensive was directed at Army Group Center, which was closest to Moscow. With no shelter, few supplies, inadequate winter clothing, chronic food shortages, and nowhere to go, German troops had no choice but to wait out the winter in the frozen wasteland. The Germans managed to avoid being routed by Soviet counterattacks but suffered heavy casualties from battle and exposure. At the time, the seizure of Moscow was considered the key to victory for Germany. Historians currently debate whether or not loss of the Soviet capital would have caused the collapse of the Soviet Union, but Operation Barbarossa failed to achieve that goal. In December 1941, Nazi Germany joined Japan in declaring war against the United States. Within six months from the start of Operation Barbarossa, the strategic position of Germany had become desperate, since German military industries were unprepared for a long war. The outcome of Operation Barbarossa was at least as detrimental to the Soviets as it was to the Germans, however. Although the Germans had failed to take Moscow outright, they held huge areas of the western Soviet Union, including the entire regions of what are now Belarus, Ukraine, and the Baltic states, plus parts of Russia proper west of Moscow. The Germans held up to 500,000 square miles (1,300,000 km²) of territory with over 75 million people at the end of 1941, and would go on to seize another 250,000 square miles (650,000 km²) before being forced to retreat after defeats at Stalingrad and Kursk. However, the occupied areas were not always properly controlled by the Germans and underground activity rapidly escalated. Wehrmacht occupation had been brutal from the start, due to directives issued by Hitler himself at the start of the operation, according to which Slavic peoples were considered an inferior race of untermenschen. This attitude immediately alienated much of the population from the Nazis, while in some areas at least (for example, Ukraine) it seems that some local people had been ready to consider the Germans as liberators helping them to get rid of Stalin. The grave situation in which the beleaguered German army found itself towards the end of 1941 was due to the increasing strength of the Red Army, compounded by a number of factors which in the short run severely restricted the effectiveness of the German forces. Chief among these were their overstretched deployment, a serious transport crisis affecting supply and movement and the eroded strength of most divisions. The infantry deficit that appeared by September 1, 1941 was never made good. For the rest of the war in the Soviet Union, the Wehrmacht would be short of infantry and support services. Parallels have been drawn with Napoleon's invasion of Russia. German war planners grossly underestimated the mobilization potential of the Red Army: its primary mobilization size (i.e. the total of already trained units that could be put on a war-footing in short time) was about twice as large as they had expected. By early August, new armies had taken the place of the destroyed ones. This fact alone implied the failure of Operation Barbarossa, for the Germans now had to limit their operations for a month to bring up new supplies, leaving only six weeks to complete the battle before the start of the mud season, an impossible task. On the other hand, the Red Army proved capable of replacing its huge losses in a timely fashion, and was not destroyed as a coherent force. When the divisions consisting of conscripts trained before the war were destroyed, they were replaced by new ones, on average about half a million men being drafted each month for the duration of the war. The Soviets also proved very skilled in raising and training many new armies from the different ethnic populations of the far flung republics. It was this Soviet ability to mobilize vast (if often badly trained and equipped) forces within a short time and on a continual basis which allowed the Soviet Union to survive the critical first six months of the war, and the grave underestimation of this capacity which rendered German planning unrealistic. In addition, data collected by Soviet intelligence excluded the possibility of a war with Japan, which allowed the Soviets to transfer forces from the Far East to the European theater. The German High Command grossly underestimated the effective control the central Soviet government exercised. The German High Command incorrectly believed the Soviet government was ineffective. The Germans based their hopes of quick victory on the belief the Soviet communist system was like a rotten structure which would collapse from a hard blow. In fact, the Soviet system proved resilient and surprisingly adaptable. In the face of early crushing defeats, the Soviets managed to dismantle entire industries threatened by the German advance. These critical factories, along with their skilled workers, were transported by rail to secure locations beyond the reach of the German army. Despite the loss of raw materials and the chaos of an invasion, the Soviets managed to build new factories in sufficient numbers to allow the mass production of needed war machines. The Soviet government was never in danger of collapse and remained at all times in tight control of the Soviet war effort. The start of the war, in the dry summer, was the most favorable for the Germans, as they took the Soviets by surprise and destroyed a large part of the Soviet army in the first weeks. When favorable weather conditions gave way to the harsh conditions of the fall and winter and the Soviet Army recovered, the German offensive began to falter. The German army could not be sufficiently supplied for prolonged combat; indeed there was simply not enough fuel available to let the whole of the army reach its intended objectives. This was well understood by the German supply units even before the operation, but their warnings were disregarded. The entire German plan was based on the premise that within five weeks the German troops would have attained full strategic freedom due to a complete collapse of the Red Army. Only then would it have been possible to divert necessary logistic support to the fuel requirements of the few mobile units needed to occupy the defeated state. German infantry and tanks stormed 300 miles (500 km) ahead in the first week, but their supply lines struggled to keep up. Russian railroads could at first not be used due to a difference in railway gauges, until a sufficient supply of trains was seized. The railroad tracks and convoys of slow-moving vehicles were also favorite targets of Soviet partisans, although partisan activity was still low in 1941. Lack of supplies significantly slowed down the blitzkrieg. The German logistical planning also seriously overestimated the condition of the Soviet transportation network. The road and railway network of former Eastern Poland was well known, but beyond that information was limited. Roads that looked impressive on maps turned out to be just mere dust roads or were only in the planning stages. The German forces were not prepared to deal with harsh weather and the poor road network of the USSR. In autumn, the terrain slowed the Wehrmacht’s progress. Few roads were paved. The ground in the USSR was very loose sand in the summer, sticky muck in the autumn, and heavy snow during the winter. The German tanks had narrow treads with little traction and poor flotation in mud. In contrast, the new generation of Soviet tanks such as the T-34 and KV had wider tracks and were far more mobile in these conditions. The 600,000 large western European horses the Germans used for supply and artillery movement did not cope well with this weather. The small ponies used by the Red Army were much better adapted to this climate and could even scrape the icy ground with their hooves to dig up the weeds beneath. German troops were mostly unprepared for the harsh weather changes in the autumn and winter of 1941. Equipment had been prepared for such winter conditions, but the ability to move it up front over the severely overstrained transport network did not exist. Consequently, the troops were not equipped with adequate cold-weather gear, and some soldiers had to pack newspapers into their jackets to stay warm while temperatures dropped to record levels of at least -30 °C (-22 °F). To operate furnaces and heaters, the Germans also burned precious fuel that was difficult to re-supply. Soviet soldiers often had warm, quilted uniforms, felt-lined boots, and fur hats. Some German weapons malfunctioned in the cold. Lubricating oils were unsuitable for extreme cold, resulting in engine malfunction and misfiring weapons. To load shells into a tank’s main gun, frozen grease had to be chipped off with a knife. Soviet units faced less severe problems due to their experience with cold weather. Aircraft were supplied with insulating blankets to keep their engines warm while parked. Lighter-weight oil was used. A common myth is that the combination of deep mud, followed by snow, stopped all military movement in the harsh Russian winter. In fact, military operations were slowed by these factors, but much more so on the German side than on the Soviet side. The Soviet December 1941 counteroffensive advanced up to 100 miles (160 km) in some sectors, demonstrating that mobile warfare was still possible under winter conditions. When the severe winter began, Hitler became fearful of a repeat of Napoleon's disastrous retreat from Moscow, and quickly ordered the German forces to hold their ground defiantly wherever possible in the face of Soviet counterattacks. This became known as the "stand or die" order. This prevented the Germans from being routed, but resulted in heavy casualties from battle and cold. Soviet World War 2 poster. 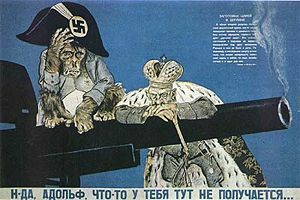 Translation: "So, as I see you also have troubles" (with conquering Russia; monkey represents Napoleon/Hitler). Stalin deported German POWs to labor camps. Ethnic groups were also deported en masse to the east. Examples include: in September 1941, 439,000 Volga Germans (as well as more than 300,000 other Germans from various locations) were deported mainly to Kazakhstan as their autonomous republic was abolished by Stalin's decree; in May 1944, 182,000 Crimean Tatars were deported from the Crimea to Uzbekistan; and the complete deportation of Chechens (393,000) and Ingushs (91,000) to Kazakhstan took place in 1944 (see Population transfer in the Soviet Union). Germany's inability to achieve victory over the Soviet Union in Operation Barbarossa opened up the possibility for Soviet counterattacks to retake lost land and attack further into Germany proper. Starting in mid-1944, the overwhelming success in Operation Bagration and the quick victory in the Lvov-Sandomierz Offensive led to an unbroken string of Soviet gains and unsupportable losses for the German forces. Germany would never again mount a successful attack on the Soviet Union. Operation Barbarossa's failure paved the way for Soviet forces to fight all the way to Berlin, helping to cement the Allied victory and the ultimate fall of Nazism and Germany's defeat in World War II. 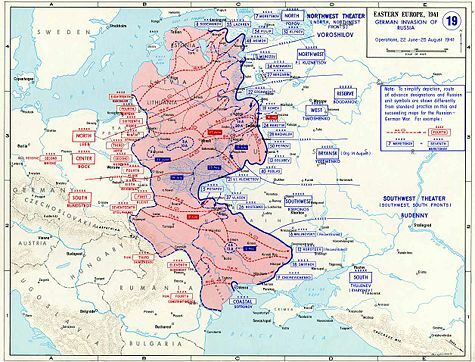 The failure of Barbarossa resulted in Hitler's demands for additional operations inside Russia, all of which eventually failed, such as continuation of the Siege of Leningrad, Operation Nordlicht, and Battle of Stalingrad, among other battles on the occupied Russian territory. Operation Barbarossa remains the largest military operation—in manpower, area traversed, and casualties—in human history. The failure of Operation Barbarossa resulted in the eventual defeat of Nazi Germany and is considered a turning point for the Third Reich. Most importantly, Operation Barbarossa opened up the Eastern Front, which ultimately became the biggest theater of war in world history. 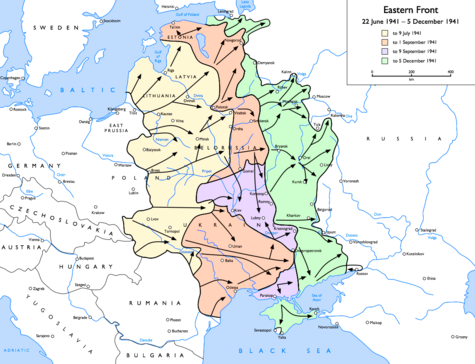 Operation Barbarossa and the areas which fell under it became the site of some of the largest and most brutal battles, deadliest atrocities, terrible loss of life, and horrific conditions for Soviets and Germans alike–all of which influenced the course of both World War II and twentieth century history. ↑ Christer Bergström. 2007. Barbarossa - The Air Battle: July-December 1941. (London: Chervron/Ian Allen), 130: Uses Soviet Record Archives including the Rosvoyentsentr, Moscow; Russian Aviation Research Trust; Russian Central Military Archive TsAMO, Podolsk; Monino Air Force Museum, Moscow. ↑ 3.0 3.1 About the German Invasion of the Soviet Union Retrieved November 20, 2008. ↑ Bergström, 2007, 118: Sources Luftwaffe strength returns from the Archives in Freiburg. ↑ THE TREATMENT OF SOVIET POWS: STARVATION, DISEASE, AND SHOOTINGS, JUNE 1941- JANUARY 1942. United States Holocaust Memorial Museum. Retrieved November 20, 2008. ↑ Bryan I. Fugate. Operation Barbarossa. Strategy and tactics on the Eastern Front, 1941. (Novato: Presidio Press, 1984). ↑ Cynthia Roberts, "Planning for War: The Red Army and the Catastrophe of 1941." Taylor and Francis Publishers. Europe-Asia Studies 47 (8) (Dec, 1995): 1297-1298. ↑ Alan Clark. Barbarossa: The Russian–German Conflict, 1941–45. (New York: William Morrow & Co., 1965), 165. Bergstrom, Christer 2007. Barbarossa - The Air Battle: July-December 1941. London: Chervron/Ian Allen. ISBN 9781857802702.
de Caulaincourt, Armand. With Napoleon in Russia. (Dover Books on History, Political and Social Science) edited by Jean Hanoteau, and George Libaire. (translated from the French Souvenirs du duc de Vicence in 1837–1840.) reprint ed. Minneola, NY: Dover, ISBN 0486440133. Erickson, John. The Road to Stalingrad. London: Cassell Military, 2003. ISBN 0304365416. Erickson, John and David Dilks, eds. Barbarossa: The Axis and the Allies. Edinburgh: Edinburgh University Press, (1994) 1998 ISBN 0748611118. Fugate, Bryan I. Operation Barbarossa. Strategy and tactics on the Eastern Front, 1941. Novato: Presidio Press, 1984. ISBN 0891411976. Glantz, David M. Barbarossa: Hitler's invasion of Russia, 1941. Stroud, Gloucestershire: Tempus, 2001. ISBN 075241979X. Glantz, David M. Stumbling Colossus: The Red Army on the Eve of World War. Lawrence, KS: University Press of Kansas, 1998. ISBN 0700608796. Glantz, David M. Colossus Reborn: the Red Army at War, 1941–1943. Lawrence: University Press of Kansas, 2005. ISBN 0700613536. Gorodetsky, Gabriel. Grand Delusion: Stalin and the German Invasion of Russia. New Haven, CT; London: Yale University Press, 2001. ISBN 0300084595. Higgins, Trumbull. Hitler and Russia: The Third Reich in a Two-Front War, 1937-1943. London: The Macmillan Company, 1966. Hoffmann, Joachim. Stalin's War of Extermination. Capshaw, AL: Theses & Dissertations Press, 2001. ISBN 0967985684. Kershaw, Robert J. War Without Garlands: Operation Barbarossa, 1941/42. Shepperton: Ian Allan, 2000. ISBN 071102734X. Kirchubel, Robert. Operation Barbarossa 1941 (Vol 1): Army Group South. Oxford: Osprey, 2003. ISBN 1841766976. Kirchubel, Robert. Operation Barbarossa 1941 (Vol 2): Army Group North. Oxford: Osprey, 2005. ISBN 184176857X. Krivosheyev, G. Grif sekretnotsi snyat. Poteri vooruzhyonnykh sil SSSR v voynakh, boyevykh deystviyakh i voyennykh konfliktakh, Voyenizdat. Moscow: 1993. Krivosheev, G.F., ed. Soviet casualties and combat losses in the twentieth century. London: Greenhill Books, 1997. ISBN 1853672807. Available on-line (in Russian). Latimer, Jon. Deception in War. London: John Murray, 2001. ISBN 9781585672042. Lubbeck, William; David B. Hurt. At Leningrad's Gates: The Story of a Soldier with Army Group North. Philadelphia, PA: Casemate, 2006. ISBN 1932033556. Macksey, Kenneth. Why the Germans Lose at War: The Myth of German Military Superiority. London: Greenhill Books, 1999. ISBN 1853673838. Maser, Werner. Der Wortbruch: Hitler, Stalin und der Zweite Weltkrieg. München: Olzog, 1994. ISBN 378928260X; München: Heyne, 2001.ISBN 3453117646. Megargee, Geoffrey P. War of Annihilation: Combat and Genocide on the Eastern Front, 1941. Lanham, MA: Rowman & Littelefield, 2006. ISBN 0742544818. Murphy, David E. What Stalin Knew: The Enigma of Barbarossa. New Haven, CT; London: Yale University Press, 2005. ISBN 0300107803; Reviewed by Robert Conquest at The American Historical Review 111 (2)(2006): 591. Pleshakov, Constantine. Stalin's Folly: The Tragic First Ten Days of World War Two on the Eastern Front. Boston: Houghton Mifflin, 2005. ISBN 0618367012. Proektor, D. M. Fashizm, put agressii i gibeli (Borba narodov protiv fashizma i agressii). "Nauka"; Izd. 2., dop edition, 1989. Raus, Erhard. Panzer Operations: The Eastern Front Memoir of General Raus, 1941–1945, compiled and translated by Steven H. Newton. New York: Da Capo Press, 2005. ISBN 0306814099. Rayfield, Donald. Stalin and his Hangmen. London: Penguin Books, 2004. ISBN 0141003758; Reviewed by David R. Snyder in The Journal of Military History 69 (1) (2005): 265–266. Roberts, Cynthia, "Planning for War: The Red Army and the Catastrophe of 1941." Taylor and Francis Publishers. Europe-Asia Studies 47 (8) (Dec, 1995): 1293-1326. Rees, Laurence. War of the Century: When Hitler Fought Stalin. New York: New Press, 1999. ISBN 1565845994. Stolfi, R.H.S. German Panzers on the Offensive: Russian Front. North Africa, 1941–1942. Atglen, PA: Schiffer Publishing, 2003. ISBN 0764317709. Suvorov, Viktor. The Chief Culprit: Stalin's Grand Design to Start World War II. Dulles, VA: Potomac Books, 2007. ISBN 1597971146. Taylor, A.J.P. and S.L. Mayer, eds. A History Of World War Two. London: Octopus Books, 1974. ISBN 0706403991.
van Creveld, Martin. Supplying War: Logistics from Wallenstein to Patton. Cambridge: Cambridge University Press, 1977. ISBN 0421297931. 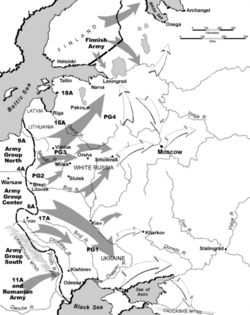 Weeks, Albert L. Stalin's Other War: Soviet Grand Strategy, 1939–1941. Lanham, MD: Rowman & Littlefield, 2002. ISBN 0742521915. Wegner, Bernd, ed. From Peace to War: Germany, Soviet Russia, and the World, 1939–1941. Providence, RI: Berghahn Books, 1997. ISBN 1571818820; Reviewed by Peter Konecny, Canadian Journal of History 34 (2) (Aug., 1999): 288–290. Ziemke, Earl F. Moscow to Stalingrad: Decision in the East. Washington DC: U.S. Army Center of Military History, 1987; New York: Military Heritage Press, 1988. ISBN 0880292946. Ziemke, Earl F. Stalingrad to Berlin: The German Defeat in the East. Washington, DC: U.S. Army Center of Military History, 1966; Honolulu, HI: University Press of the Pacific, 2003. ISBN 1410204146. Мельтюхов, М.И. Упущенный шанс Сталина. Советский Союз и борьба за Европу: 1939–1941 (Документы, факты, суждения) Москва: Вече, 2000. Суворов, В. Последняя республика: Почему Советский Союз проиграл Вторую Мировую войну. Москва: AST, 2003. ISBN 5170078765. Operation Barbarossa—Detailed analysis of the operation by author Bevin Alexander. This page was last modified on 21 December 2018, at 15:51.